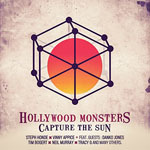 Share the post "Album review: HOLLYWOOD MONSTERS – Capture The Sun"
French multi-instrumentalist Steph Honde released a debut album in 2014 with Paul D’ianno and Vinny Appice in the ranks and ‘Capture The Sun’ continues the tradition. Albums that feature a roster of name artists – legends if you will – brought together by a single musician rise and fall by the strength of the material. And unfortunately no amount of talent can cover up the lack of killer tunes on his latest offering. The same applied to that debut. The album might be of only passing interest to fans of the participating artists, so if you like Vinny Appice, Tracy G and Neil Murray investigate one track, ‘Evilution’. Elsewhere it’s clear that Honde takes a cue from the Coverdale school of crooning (‘Waiting’) although in truth at the end he over-extends himself. The track ‘Another Day In Grey Part II’ is as drab as the title. Honde makes a play for widescreen acceptance with the spoken word effects on the instrumental ‘Don’t Let It Happen’ but Pink Floyd it ain’t. Jenny Haan (Babe Ruth) crops up on the title track but regrettably it is a duet with Honde. And perhaps inevitably – with a paucity of decent material – Honde falls back on two covers: the eight-minute Bowie’s Sweet Thing/Candidate and a bonus knees-up of ‘Fool For Your Loving’. This entry was posted in ALBUM REVIEWS, ALBUM REVIEWS (Mobile), All Posts and tagged album, Capture The Sun, classic rock, Craig Goldy, Danko Jones, hard rock, Hollywood Monsters, Jenny Haan, Neil Murray, review, Steph Honde, Tim Bogert, Tracy G, Vinny Appice. Bookmark the permalink.